I recently had the most wonderful ThetaHealing session with the beautiful Jennifer Cain. This chic is so tuned in that in a half an hour session she helped me bust some blocks that I'd been holding onto for lifetimes! She's so darn lovely too, so of course I wanted to invite her over for a pyjama party New Age Hipster style and find out more about this incredible Lightworker! <3 OMG are you so excited to be at my New Age Hipster Girl Crush Pyjama Party or what?! <3 What music do you want at the pyjama party? Taylor swift, Cyndi Lauper, Backstreet Boys and some Kundalini Yogi mantras purlease DJ! <3 What pyjamas are you going to wear? Big fluffy bunny slippers, an oversized t shirt and some comfy pants! <3 So like, how do you make money to pay for those cool fluffy bunny slippers and all your awesome clothes and make up and stuff? Well I am a healer and intuitive coach by day. I also run meditation classes in Edinburgh! <3 How did you get that job? I always felt I was meant to use my natural healing abilities in a professional capacity. Everyone has these abilities I just decided I would like to make it into my job and so with a lot of training, studying spiritual topics, meeting the right people and doing a lot of work on myself I was ready to take on clients. I absolutely love my job, I feel like I have finally arrived with this work! <3 So what fun stuff will we find you doing on school nights? Ooh I have skype dates with my superbly awesome and inspiring friends. We chat world peace, supporting each other and sometimes do some healing swaps! I also like to check out what’s going on in the social media sphere, write in my journal and listen to some mantra style music to meditate too! Rock and roll I know, haha. <3 How about on the weekend? Well on the weekend I like to take my dog Charlie out for walkies. I love to attend cool events, usually with a spiritual theme and on the odd occasion I have been known to get on my dancing shoes and hit the town, but those days are rarer now than they used to be! <3 What do you want to be when you grow up? <3 Where do you buy your clothes? I got a really lovely dress from River Island recently. I also love Zara, I purchased a beautiful light brown, suedette, hippy style fringe jacket from there a few weeks ago. It’s so 70’s and vintage looking I really dig it man, lol. <3 What are your favourite beauty products? Anything natural! I love Neals Yard Remedies, they do a lovely 92% Organic lipgloss! Yum! <3 Who does your hair? My friend Emma, she owns her own salon in my hometown and I have never had anyone cut, colour and style it as good as her! I go in and she asks me what I want and I’m like “What do you think?” She comes up with some amazing idea with a little input from me and I leave with an awesome new do, every time! Her place is called Monroe’s. <3 I'm getting hungry, what's your favourite pyjama party food and beverages? Hmm I’m a bit addicted to my nutribullet right now. I have wanted one for ages and my mum bought me it for my birthday last week! Stick lots of organic greens and some yummy coconut milk in there and I’ll be a happy bunny! Oh and Doritos, the cheesy ones, you can’t have a pyjama party without Doritos! <3 I agree! Favourite pizza topping? If I was being fancy I would say wild rocket, pesto and parmesan… so yeh I’m being fancy those three please! <3 Mmmmmm... favourite high school movie? Grease. Obvs. When I was 5 I remembered being so totally heartbroken because I was in love with Danny Zucco, but I still had the knowledge that because it was an old movie that John Travolta would be way too old for me. I cried about it a lot! Strange child! <3 It's getting late so we have to tell ghost stories! Do you believe in ghosts? Have you ever seen one? <3 Have you ever had a spooky or paranormal encounter? Yes, many! I’m pretty weird to be honest lol and I pick up on quite a lot from my environment. The place I grew up is pretty old so there are lots of legends and creepy old buildings and graveyards and stuff. When I was about 15 I went on a Ghost tour in Edinburgh with some friends from school. I was so scared! I totally overreacted! They said we had entered a place so haunted that it was shut off to members of the public and that a poltergeist lived there. I was like get me outta here!!! lol! <3 What do you think happens when we die? I think we leave our physical bodies and ascend to the realm of the non-physical and there we can choose whether we want to come back again or we want to stay in heaven. <3 Who do you think you were in a past life? I know I have been murdered lots in past lives, nice huh? Lol I have been a witch, a healer, a high priestess, a nun and a slave that I know of so far. But I think I was also a dolphin and a tree too. Next lifetime I’m going for Unicorn or ascended master, so nothing major. <3 What time do you usually go to bed? <3 What do you want to do tomorrow? Tomorrow I want to see what miracles await me! I love letting life unfold around me and just jumping in and seeing what happens. Obviously I make some plans when I need to but the rest is up to interpretation! And things turn out so much better that way! <3 Who's your girl/boy crush?! YOU Vix! Haha and Russell Brand, I loves me some Russell! 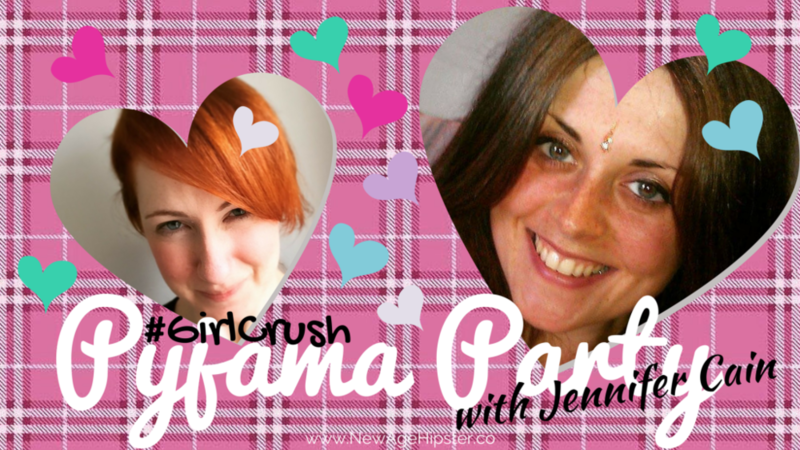 <3 Because you are so girl crush-worthy probably lots of other girls and boys are going to want you at their pyjama parties too. How can they find you? !